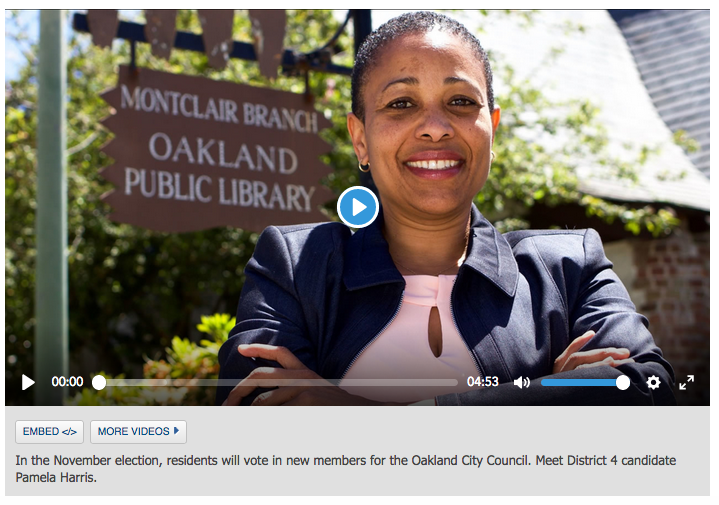 We now recommend that voters in District 4 — which stretches from Montclair to the edge of the Fruitvale District — elect Pamela Harris, an accounting consultant and filmmaker. Less than a month before the November election, the only three female candidates in the District 4 city council race did something rare. The three frontrunners—Pam Harris, Nayeli Maxson and Sheng Thao— launched a campaign to support each other. In a video posted on social media, the candidates asked voters to support all three women on their ballots. Like other Oakland races, the District 4 city council race will be determined by ranked choice voting, in which voters not only cast a ballot that lists their first-choice candidate but to also their second and third choices. Our budget is a direct reflection of our values. As a financial services provider for non-profits and community-based organizations, I am intimately familiar with what it means to incorporate values into budgets. 6) Working with district residents to ensure our budget is a reflection of our shared values. Pam Harris felt her voice needed to be heard, too. As a lesbian of color Harris is running for Oakland City Council. She became involved with the state Democratic party after the 2016 election and met several elected officials. Harris said it needs to be easier to build high-density housing units. “We need to streamline our services and permitting process to make it easier to build,” said Harris. “Specifically, we need to make it easier to build higher density—yes, even in our district.” Harris says affordable housing units needs to be built into all new developments. “We’re still a place that looks at affordable housing as being ‘over there,’” she said. It was her young son's reaction to Trump's election that led her to become more politically engaged. "After the last election, my son - I think he was 7 at the time - he woke up and at the top of his lungs said, 'I am not coming down and stepping foot in a country where that man is president.' I had to convince him to come down, and really what I was saying to him was to not let that person stop us," recalled Harris, a former Fulbright grantee to Uruguay. A former board member of the LGBT-focused East Bay Stonewall Democratic Club, Harris was elected a delegate to the California Democratic Party from her Assembly District in January last year. The top-vote getter in that race, Harris hopes her no-nonsense style will connect with voters in the council district. "People really want someone who is plainspoken and no BS," said Harris. Should she be elected, Harris would be the first out African-American to serve on the Oakland City Council and only the fourth out council member.